Developmentally important genes often result in early lethality in knockout animals. Thus, the direct role of genes in late gestation organogenesis cannot be assessed directly. In utero delivery of transgenes was shown previously to result in high efficiency transfer to pulmonary and intestinal epithelial stem cells. Thus, this technology can be used to evaluate late gestation development. In utero gene transfer was used to transfer adenovirus with either an antisense c-myc or a C-MYC ubiquitin targeting protein to knockout out c-myc expression in late gestation lung and intestines. Using either antisense or ubiquitin mediated knockout of C-MYC levels in late gestation resulted in similar effects. Decreased complexity was observed in both intestines and lungs. Stunted growth of villi was evident in the intestines. In the lung, hypoplastic lungs with disrupted aveolarization were observed. These data demonstrated that C-MYC was required for cell expansion and complexity in late gestation lung and intestinal development. In addition they demonstrate that transient in utero knockout of proteins may be used to determine the role of developmentally important genes in the lungs and intestines. C-MYC is a member of the MYC family of transcription factors that participates in the control of proliferation, metabolism, apoptosis, growth and differentiation. C-MYC contains a basic, helix-loop-helix leucine-zipper motif (bHLH-LZ) and binds to E-box sequences (CACGTG) as a heterodimer with MAX, another bHLH-LZ protein [1, 2]. The MYC/MAX heterodimer activates or represses transcription depending on the target gene. This protein's role during early embryonic development is well established. Homozygous null C-MYC and N-myc mice die at embryonic days 10 and 12, respectively [3, 4]. C-MYC is also expressed at high levels in the lung later in gestation, but its role during that time is poorly understood because of the early embryonic lethality in the knockout mice. C-MYC is a target of the Wnt signaling pathway, which is crucial for the normal lung and intestine development [5, 6]. We have developed an in utero gene transfer method that uses small quantities of recombinant adenovirus at times during gestation when the lung and intestine epithelium is largely composed of stem cells . Recombinant adenoviruses at 108 pfu/ml of amniotic fluid have been transferred to mice, rats, and rhesus monkeys [8–12]. The high transfer efficiency and absent immune response allow the use of recombinant adenoviruses to transfer genes to the lung and intestinal epithelium to mid-gestational embryos and transiently alter gene expression. Knockouts c-myc are embryonic lethal . An approach that would eliminate c-myc later in development is needed to address the issue of c-myc's involvement in lung and intestinal development. Transient in utero knockout out (TIUKO) is uniquely suited, because the procedure can be applied to different gestational times when c-myc may be intimately involved in the differentiation of specific lung and intestinal cells types. In the present study, two approaches using adenoviruses were used to decrease or eliminate c-myc levels in utero; 1) the expression of an antisense c-myc mRNA  and 2) the expression of an engineered βTrCP ubiquitin-protein ligase that specifically knocks out targeted proteins . An antisense to c-myc [3, 13, 14] was used as a preliminary test of the transient in utero antisense knockout technique. To test the efficacy of the TIUKO method and to determine the extent of the role of c-myc in mid-gestation lung and intestine development, cftr +/+, S498X mouse fetuses  were injected with a final concentration of 108 pfu/ml of amniotic fluid of an adenovirus that encoded a 500 bp fragment of c-myc in the 3'-5' orientation (AdCMVASmyc). The control fetuses were injected with adenovirus encoding the reporter genes luciferase or green fluorescent protein (GFP), both previously shown to have no affect on development [10–12]. Therefore, all of the experimental animals were controlled for surgical manipulation, vector injection and the 10% increase in amniotic fluid volume that occurs with the gene transfer. There were 58 fetuses from 7 litters in the control group and 94 fetuses from 11 litters in the TIUKO group. The fetuses from 2 litters in the antisense group suffered intrauterine demise of unknown origin and were not included in the analysis. The effect of antisense c-myc on constitutive protein expression was evaluated by fluorescent immunohistochemistry at day 1 post partum following a 21 day gestation period. 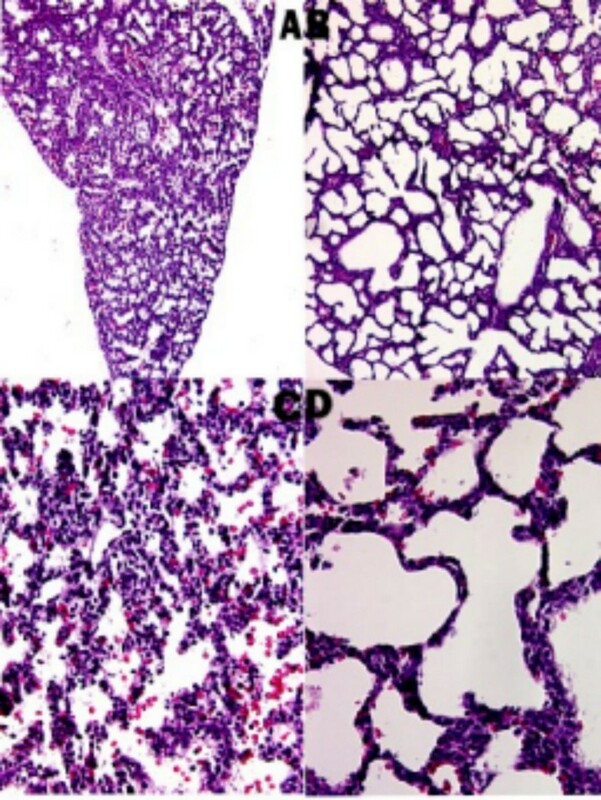 Western blots were not used to determine protein expression because evaluation of the entire lung would not reflect changes in the small population of epithelial cells in contact with the amniotic fluid at the time of treatment. As shown in Fig. 1B (control Fig. 1A), decreased C-MYC expression was documented in the lung at 1 day of age following intra-amniotic AdCMVASmyc administration at 15–16 days gestation (5–6 days following intrauterine antisense gene transfer). The other primary target organ of in utero gene transfer, the intestines, showed a similar decrease in C-MYC expression (Fig. 1D; control Fig. 1C). The use of image analysis  to quantitatively measure C-MYC expression demonstrated an 86.2% and 61.3% decrease in expression in the lung and intestine respectively. While mice with a null mutation in c-myc exhibit early embryonic lethality , introduction of the antisense gene past this period permitted the evaluation of c-myc's later role in organ development. 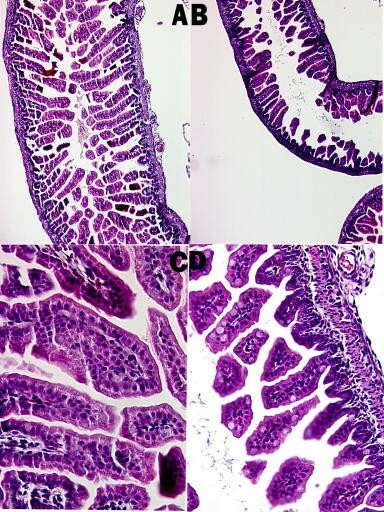 All of the AdCMVASmyc treated mice examined demonstrated intestinal histology indicative of decreased complexity (Fig. 2B &2D). Villus hypoplasia was apparent when compared to control (AdCMVluc treated; Fig. 2A and 2C)) intestine at comparable levels. The effect of decreased C-MYC expression on the morphologic structure of the lung was also evaluated following treatment with AdCMVASmyc. 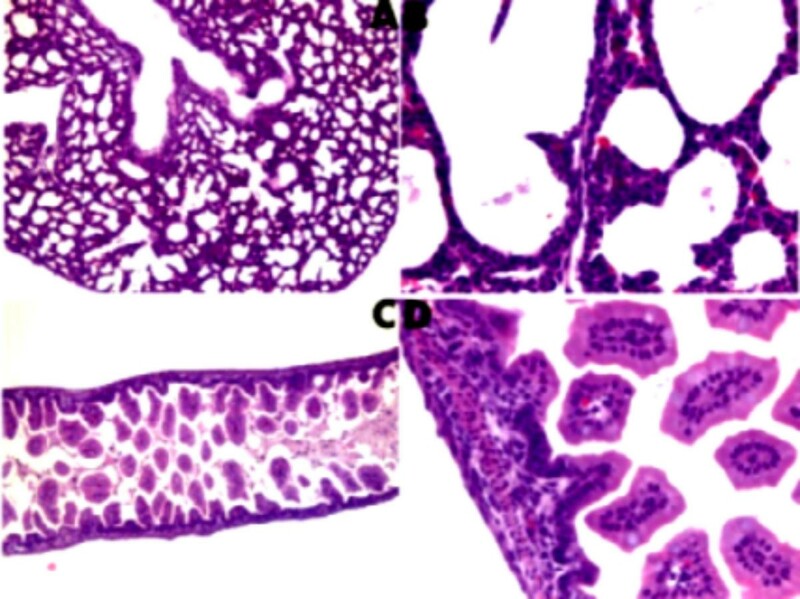 The histologic appearance of the lung of the AdCMVASmyc treated mice compared to age-matched mice treated with AdCMVluc as a control is demonstrated in Figure 3. Lungs treated with c-myc antisense (Fig. 3B &3D) demonstrated markedly decreased complexity when compared to the control lung (Fig. 3A &3C). This decreased complexity was characterized by enlarged simplified airspaces of the lung parenchyma. Again, respective magnifications of comparative panels are the same. The pulmonary hypoplasia was reflected in the comparison of the lung weight to body weight ratios  between the two groups. The lung weight/body weight ratio of the control group at 21 days gestation was .034 ± .0012 while the lung weight/body weight ratio of the antisense c-myc group was .028 ± .0009 (p < 0.001; Student T-test). Given the gross inhibition of normal development in the lung and intestines, it was not surprising that two litters (16 mice) of the AdCMVASmyc-treated animals not harvested at 1 day of age died within several days of birth. However, these experiments demonstrated that the TIUKO method was capable of inhibiting expression of a protein normally present in a multipotential stem cell population and affecting normal organ development. In addition, they suggested a role of C-MYC in mid-gestation cell proliferation in the development of both the lung and intestines. The SCF (Skp1, Cullin, F-box-containing substrate receptor, and the RING domain protein ROC1/Rbx1/Hrt1) ubiquitination machinery is a major proteolysis apparatus that controls cell cycle, signal transduction, and development through selective degradation of key regulators involved in these processes (recently reviewed in ). This proteolytic machinery is ubiquitously expressed in all tissues and cell types, and it is constitutively active throughout the cell cycle [15, 19]. The SCF ubiquitin-protein ligases are composed of four proteins: Skp1, Cullin 1, F-box-containing substrate receptor, and the RING domain protein ROC1/Rbx1/Hrt1. βTrCP is one of more than 70 F-box proteins identified in mammals [20, 21], which targets degradation of IκB, β-catenin, ATF4, and Emi1 [22–27]. Biochemical studies further separate βTrCP into two modular domains: the F-box in the middle portion is responsible for binding Skp1 and connecting to the core SCF ubiquitination complex, while the seven WD40 repeats at the carboxyl terminus are exclusively responsible for binding substrates. A new technology, designated "protein knockout", was developed to harness the SCF ubiquitin-proteolytic machinery to direct the degradation of otherwise stable cellular proteins . The strategy of protein knockout is to engineer a chimeric ubiquitin-protein ligase with a peptide that binds to the intended target fused to a specific F-box protein, and therefore redirect the constitutive SCF proteolytic activity towards degradation of cellular proteins which are not normally targets of the SCF machinery. Such chimeric βTrCP ubiquitin-protein ligase has demonstrated efficient targeting of stable proteins of the retinoblastoma family and β-catenin for degradation [28–31]. To direct cellular C-MYC to the SCF ubiquitination machinery for degradation, a chimeric F-box-containing substrate receptor was constructed with the helix-loop-helix/leucine zipper region of Max fused in frame to the C-terminus of FLAG-tagged βTrCP, designated F-TrCP-Max. The helix-loop-helix/leucine zipper region of MAX was chosen since it was well characterized as the dimerization (interaction) domain with c-MYC. It serves as the targeting peptide to recruit c-myc for degradation and thus inhibits c-MYC functions. Recombinant AdTrCP-Max adenovirus was generated with the AdEasy system (Qbiogene, CA, USA) for infection of the SW613-S colon carcinoma cell line for 48 hours. As demonstrated in Fig. 4, marked reduction of the endogenous C-MYC levels was obtained  with no change in β-actin. This protein knockout system was integrated with the in utero adenoviral-based gene transfer technology to confirm the role of C-MYC in vivo during murine lung and intestive development and confirm the results of the antisense C-MYC TIUKO animals. 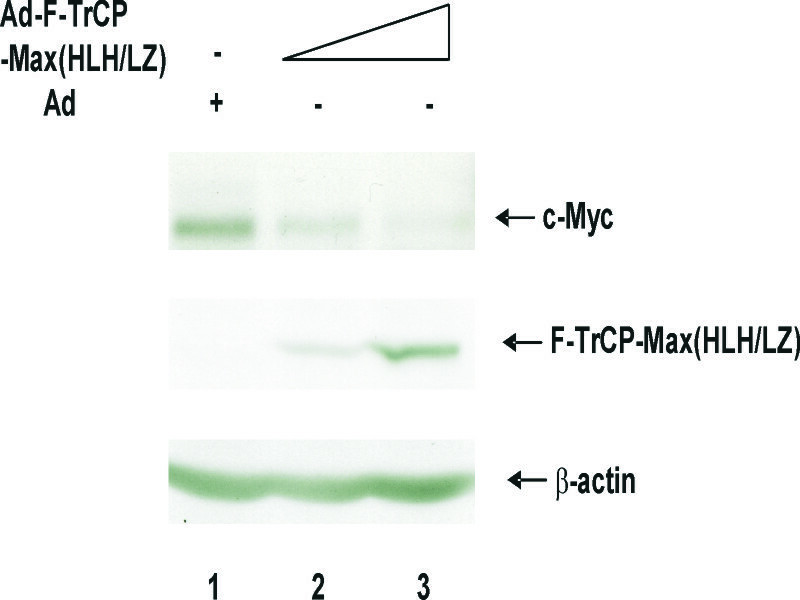 Targeted C-MYC degradation by the engineered F-TrCP-Max ubiquitin-protein ligase. SW613-3 cells were infected with either the Ad1 control (multiplicity of infection of 50, lane 1) or the AdTrCP-Max (multiplicity of infections of 30 (lane 2) or 50 (lane 3)) recombinant adenoviruses for 48 hours. The levels of endogenous C-MYC were determined by in response to Ad1 or AdTrCP-Max expression by western blotting. The β-actin levels were also determined as an internal loading control. Two litters (8–10 mice each) at 15–16 day gestation were injected with AdTrCP-Max. Newborns were harvested at birth and the lungs and intestines fixed for histologic examination. As shown in Fig. 5, changes in lung and intestine histology were readily apparent. In both tissues, decreased complexity was noted. In the lungs (Fig. 5A &5B) aveolarization was significantly inhibited as compared to untreated lungs (Fig. 3). Likewise, in the intestines (Fig. 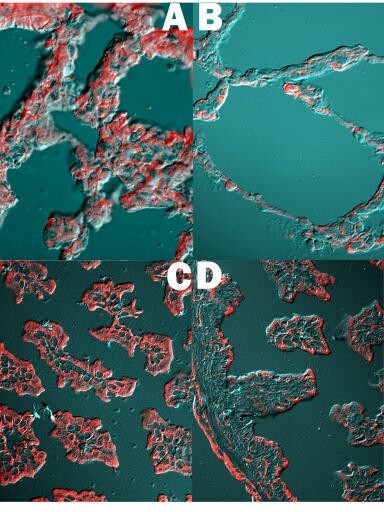 5C &5D), villi formation was stunted in comparison to normal control intestines (Fig. 2). The lung weight to body weight for the AdTrCP-Max treated animals was 0.026 ± 0.005, significantly lower than that observed in control animals (0.034 ± .001; p < 0.001) and comparable to that obtained with antisense c-myc treated mice (0.028 ± .0009). Thus, inhibition of C-MYC expression by either antisense or ubiquitin targeting results in identical phenotypes. The role of C-MYC in late development of both the lungs and intestines was unclear due to early lethality of the knockout mouse [3, 4]. C-MYC was expressed in mid- to late-gestation lungs and intestines and its presence suggested an essential role during this period of organogenesis. In this paper, C-MYC levels were reduced by treatment with either antisense C-MYC or C-MYC ubiquitin targeted degradation, using adenovirus vectors and in utero gene transfer via the amniotic fluid [7, 8, 11, 12]. In both experimental systems, identical phenotypes were obtained. Decreased complexity due to inhibition of aveolarization in the lung and villus formation in the intestines (Figs. 2, 3, 4, 5) was observed. Previous work [6, 33] has suggested that the Wnt pathway was involved in both alveolar and villi formation. C-MYC is known to be a mediator of this pathway, thus, this work is consistent with the wnt pathway playing an important role in lung and intestine development. The TIUKO method for the knockout of gene function using antisense gene constructs was validated by these data. Two adenovirus recombinants that degrade C-MYC expression by two independent methods yielded identical histologic phenotypes. Both vectors were documented to decrease C-MYC expression in vitro prior to use (Fig 4; ). The results obtained were distinct from those obtained previously with other biologically active and inactive genes delivered in the same manner [8–12]. The value of this method is the gestational and developmental timing of the gene delivery. As shown in previous in utero gene transfer studies, at 15–16 days gestation both the lungs and intestines are lined with multi-potential stem cells [7, 8, 11, 12]. Because stem cells are targeted by the amniotic fluid, in utero delivery method, the specific inhibition of C-MYC in a relative small population of cells (<107) has a highly significant effect on the histology of the rapidly developing lungs and intestines. This method can not be used to affect a specific subset of cells within the lung, because the development of the fetal immune response interferes with treatment at later times when these cell populations have differentiated from the multipotential cells present at 15–16 days gestation. This method can be used in combination with morphometric and molecular technologies to dissect developmental cascades involved in organogenesis of the lung and intestines. Late lung and intestine development require C-MYC for cell expansion required for alveolar and villi complexity. The role of C-MYC was dissected using transient in utero knockout of protein expression in late gestation. To apply protein knockout as a reverse genetic approach for functional analysis of C-MYC, a 500 bp cDNA of rat C-MYC was generated using RT-PCR. This product corresponded to nucleotides 2169–2469 (entire exon 1) and 2570–2670 (100 bp exon 2). The cDNA was subcloned into the adenovirus vector pACCMV.pLpA to generate the recombinant adenovirus, AdCMVASmyc . To apply protein knockout as a reverse genetic approach for functional analysis of C-MYC, a chimeric FLAG-tagged βTrCP (F-TrCP) ubiquitin-protein ligase was constructed with the C-MYC interacting domain of Max (Helix-loop-helix/leucine zipper region, designated HLH/LZ) in-frame fused to F- TrCP and a recombinant adenovirus generated using the Adeasy system (Qbiogene, Carlsbad, CA, USA). Timed pregnant S489X, cftr+/+ mice were induced (5%) and sedated (2%) with inhaled isoflurane. A laparotomy was performed exposing the uterine horns. The individual amniotic sacs of the fetuses were visualized and injected with fine gauge needle (27 gauge) containing adenoviral particles in 10% of the amniotic fluid volume. The recombinant adenoviruses in Dulbecco's Minimal Essential medium were delivered at a final concentration of 108 pfu/ml of amniotic fluid. At the time of sacrifice all animals received a number. This code was used for identification of all histologic and biochemical studies and all samples blinded to the investigator. All tissues were fixed in methanol-free 4% buffered paraformaldehyde and either mounted in paraffin or freezing medium (OCT) for sectioning. Fluorescent immunohistochemistry was performed with goat polyclonal IgG (Santa Cruz) specific for mouse/rat C-MYC (1:100 dilution) Secondary donkey anti-sheep ALEXA (1:500 dilution; Molecular Probes) antibodies were used. All tissues were visualized on a deconvoluting, Lieca, light microscope. Hematoxylin and eosin stain and Masson's trichrome stain were performed with kits (Sigma Chemical Co) and tissues examined by standard light microscopy. SW613-S cells (gift of Dr. Oliver Brison, Institut Gustaver Roussy, France), a colon carcinoma cell line that over expresses c-myc, were infected with either the Ad1 control adenovirus at MOI of 50, or the AdTrCP-Max recombinant adenovirus at MOI's of 30 or 50 respectively. 48 hours post infection, 100% of the recipient cells were infected, as indicated by the expression of green fluorescence protein (GFP). Cells were harvested in the NP-40 lysis buffer (150 mM NaCl, 1.0% NP-40, 50 mM Tris (PH 8.0)) to prepare protein extracts. 100 μg of each extract were subjected to electrophoresis on SDS PAGE, transferred to PVDF membrane, and immunoblotting was carried out using antibodies against c-myc (9E10) (Santa Cruz), FLAG (M2) (Sigma), and β-actin (Santa Cruz). This work was supported by the Ochsner Clinic Foundation. DKS is supported by an American Diabetes Association Career Development Award. P.Z. was a recipient of the Kimmel Scholar Award from the Sidney Kimmel Foundation for Cancer Research and was supported by NIH Grant 5-R33-CA092792, the Academic Medicine Development Company Foundation, the Mary Kay Ash Charitable Foundation, the Dorothy Ridell Cohen Foundation for Sarcoma Research, the Susan G. Komen Foundation for Breast Cancer Research, and the Speaker's Fund from the New York Academy of Medicine. JCC and JEL conceived and carried out all experiments in the project with the assistance of DKS, who also produced the antisense C-MYC adenovirus. PZ, JM, and JZ constructed and provided the ubiquitin targeting adenovirus.